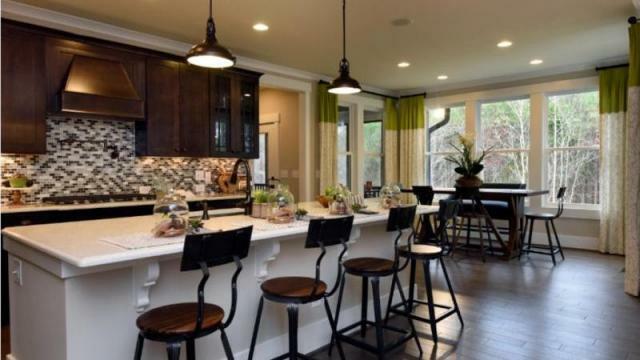 What design trends are slated for the most au courant homes in the new year? New Homes & Ideas rolled up its collective sleeves to research this question and quiz area experts to compile the following list. Read on to get the skinny on what’s expected, and think about how you might incorporate some of this 2018 chic in your own home. Neutrals are stepping aside as rich colors are allowing furnishings and décor to shine in sophisticated color settings. Although white will most likely always be a classic for kitchens, the heart of the home will benefit in 2018 with more color, not only by emoting a warmer, more welcoming vibe, but by also making food and cooking stains less noticeable. Light colored cabinets are giving way to warm wood tones such as mahogany. 2. The hot hue for 2018? Our advice at New Homes & Ideas? Get regally contemplative and get your purple on in 2018! Sinks of stone, copper, concrete, and granite are expected to rule in the new year based on the Houzz network of users and home professionals. White and stainless steel sinks will decline in popularity as this trend gains traction. Additionally, trough or bucket sinks, wider and deeper than traditional sinks as we’ve long known them, are expected to be sought after due to their functionality and harmony with farmhouse-style trends. In fact, “large farmhouse sinks with an apron front are preferred by many for our open concept kitchens,” says Heather of Fielding Homes. Think warm tones of dark gray, bronze, and black, and you’ll be trending in the right direction. Look for floral prints of high-contrasting color and oversized blooms as the statement makers of the year in the home, clothing, and accessory industries. Through the ages flowers have traditionally been linked with beauty, spring, renewal, and femininity. Although these nostalgic characteristics still apply, the 2018 trend will pack extra punch with a few of the upcoming contrast trends featuring black coupling with white, teal pairing with gold, and blue offsetting orange. If creating your own botanical color contrast has been a secret desire, 2018 is the year to step up and become a trendsetter! Energy efficient “green” lighting will continue its reign, Carla goes on to say, with clients demanding more design-forward products such as bulbs and under-cabinet lighting that look good and provide either color corrective or ambient lighting for effect. Walls of hardwood have been seen in bathrooms and kitchens for awhile now; expect to see them in bedrooms and other areas of the home in the upcoming year. Shiplap (a wooden board often used as exterior siding for barns and other rustic buildings), millwork panels, and reclaimed wood planks will be utilized frequently in 2018 as the option of choice over paint and wallpaper. 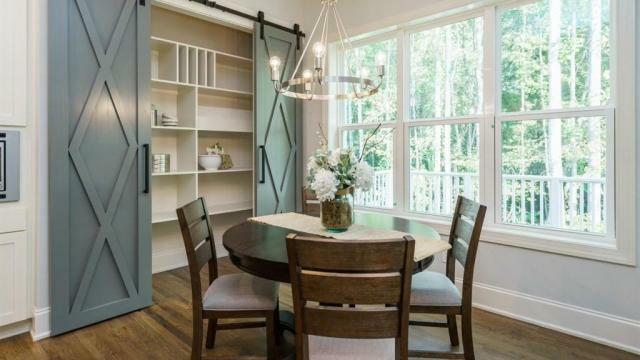 “By far the most frequent requests from new home owners are interior wall statements such as shiplap, board and batten, and sliding barn doors, which complement the Modern Farmhouse elevations that we are currently offering in several of our new home communities,” says Beth DeMore, Design Studio Coordinator at Robuck Homes. Concrete is expected to grow in 2018 beyond its function as a standard building material and option for countertops and wall coverings to become a widespread choice for furniture, accessories, and tile. The use of this natural matter allows simple items to invigorate our surroundings through elevated design. Instead of rock, paper, scissors, think rock, gravel, sand! Subway tile will always be a timeless option, but why not consider some of the new tile trends for 2018? Tile designs that mimic wood, concrete, resin, fabric, or wallpaper can add a striking element to walls in the new year. Geometric cement, terrazzo, penny round, and brickwork tile are also worthy of deliberation. The design autonomy of wallpaper will abound in the new year with the durability and damage resistance of tile. Full article by Rebecca R. Newsome, writer for New Homes and Ideas.